Defeat the demon dragon to save the one you love, Princess Celia. 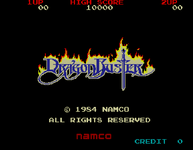 This is a port of the side scrolling multi path Arcade game of the same name. It was one of the first games to feature a vitality (health) meter and the double jump.